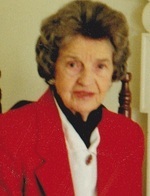 Mattie Sue Horne Montague, 95 of South Hill, Virginia died August 4, 2018 in Easton, Maryland. She was born March 14, 1923 in Mecklenburg County, Virginia, the daughter of the late Robert Lee Horne and the late Mamie Jane Bracey. She was a 1943 graduate of LaCrosse High School and then trained as a beautician in Richmond, Virginia graduating from the Davis Beauty School on February 28, 1948. After graduation she opened her beauty shop in LaCrosse, Virginia which she operated for several years. Mattie Sue married William Lynwood Montague of Oxford, North Carolina and South Hill, Virginia. Lynwood, a World War II U S Army combat veteran of the European Theater, owned Montague Hardware Company, an independent hardware, in South Hill, Virginia. Together they operated the hardware store and remained married for 37 years until Lynwood’s death in 1991. She was a devoted member of the South Hill United Methodist Church, a member of the Auxillary of the Community Memorial Hospital, lifetime member of the American Legion Auxillary, and a member of the National Society of the Daughters of the American Revolution, Prestwood Chapter. Additionally she for many years enjoyed playing cards with the ladies Canasta Club. Mattie Sue’s siblings Frank Horne, Grace Horne, Martin Horne, Roberta Horne and Robert Horne predeceased her. She is survived by her sister Louise Tudor of Richmond, Virginia and LaCrosse, Virginia; a son William Lynwood Montague Jr. MD and his wife Joyce Conrad Montague of Trappe, Maryland; a daughter Susan Montague Parkinson and husband John Thomas Parkinson, of Sanford, North Carolina; four grandchildren, Amelia Conrad Montague, William Lynwood Montague, III, Sarah Parkinson Hornbuckle and husband Robert Hornbuckle and John Thomas Parkinson II. Additionally she is survived by four great grandchildren and numerous nieces and nephews. Funeral services will be held at 2pm, Saturday, August 11, 2018 at South Hill United Methodist Church. The family will receive friends from 1pm until time of service. Interment will follow in Oakwood Cemetery, South Hill, VA. In lieu of flowers, the family requests memorial contributions in her memory be made to the South Hill United Methodist Church, 105 Franklin Street, South Hill, VA 23970. Online condolences may be placed at www.farrarfuneralhome.net. Farrar Funeral Home of South Hill is serving the Montague family.